Will 2018 Be the Year of the Landlord in Alameda? For nearly three years, Alameda’s renters and landlords have faced off in a number of political skirmishes. And each side has notched some key victories. But as the city heads toward a pivotal election this November, there’s a growing concern among renters that landlords have gained the upper hand. A ballot measure that will go before voters this fall would allow landlords to effectively block any chance of rent control or more tenant protections in Alameda for years to come. What a difference a year makes. In spring 2017, Alameda renters had reason to believe their cause was again gaining momentum. In a move strongly opposed by landlords, the Alameda City Council voted to ban the eviction of tenants for no reason and only allowed evictions for just cause — such as failure to pay rent. But the tenants’ win didn’t last long. A month later, a group of landlords funded a pair of successful petition drives: One repealed the council’s just cause vote, and the other put a measure on the November 2018 ballot that seeks to lock in place Alameda’s current weak tenant protection law and block just cause or rent control in the future. The cash-strapped Alameda Renters Coalition worried it couldn’t afford a campaign against two ballot measures, so it convinced the council to nullify the just cause ordinance. Suddenly, landlords were back on top. If voters approve the landlords’ ballot measure this fall, it means that it will take another vote of Alamedans to enact anything more tenant-friendly. Councilmember Malia Vella also argued that Alameda renters’ successes have been significant. “The thing to remember is that, although Alameda is majority tenant, we still trail San Francisco and Oakland in terms of the high ratio of tenants to landlords,” she said. Tenants’ activists are also collecting signatures for a statewide measure that would repeal Costa Hawkins — although the initiative faces an uphill battle. Apartment owners groups are expected to spend heavily against it if it qualifies for the ballot. If there is any bright spot for renters in Alameda, it comes from an unlikely place — Alameda’s Rent Review Advisory Committee, or RRAC. The panel was created by the weak tenant protection measure enacted by the council in March 2016, and it includes an appointed group of landlords, tenants, and a neutral person. The RRAC is tasked with essentially mediating rent increase disputes. It has become more professional recently and, more importantly, renters say, increasingly fair. An out-of-town landlord who participated in his first RRAC meeting in March said he believes the format was fair despite not getting his original request for a $368 a month rent increase. Instead, after the RRAC process, he and the tenants settled for $129 a month hike. 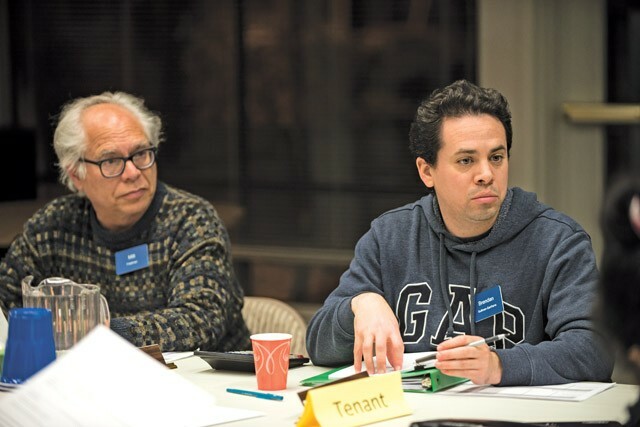 Milt Friedman, who was appointed to the RRAC as a property owner but often sides with tenants, noted that renters often face severe financial challenges because of the high costs of housing. He noted that in a recent RRAC case, the breadwinner of a family that emigrated from Nepal testified that she spends half of her salary on rent. “They’re immigrants working hard, and I don’t sense they can afford more,” said Friedman. Outside the hearing, the landlord, apparently showing no hard feelings, told the tenants that a new stovetop, which the tenants had told the RRAC they needed, would be delivered the next day. But not all matters in front of the RRAC are warm and fuzzy. Earlier this year, a trustee for one property petitioned the RRAC to hike rents by 133 percent, which would have raised the rent on a three-bedroom Alameda townhome to $3,500 a month. RRAC members countered with a recommendation of a $750 increase, but the trustee turn down the proposal. Later, after the matter went to the city council, the trustee and tenants agreed to stagger the increase over the next year, topping out at $3,000 a month. The situation was resolved, but for renters, the case pointed out basic flaws with Alameda’s tenant protection law: It still heavily favors landlords, and it blocks the RRAC from imposing smaller rent hikes. If landlords win again November, it’ll remain that way in Alameda for years to come.